Following a stoke, our rehabilitation care is there to help individuals regain their independence. Baptist Health’s multidisciplinary rehabilitation team provides caring, personalized assistance to help patients meet their goals. Baptist Health has earned the Gold Seal of Approval™ from The Joint Commission for Primary Stroke Centers. The hospital follows national standards and guidelines published by the Brain Attack Coalition and the American Stroke Association for stroke care. Less than 1% of all hospitals in the United States have received this certification. 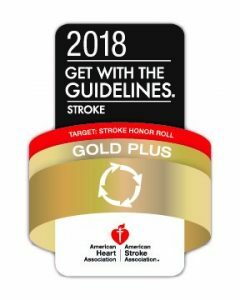 Baptist Health has also been named a “Top Stroke Center” by the American Heart Association and was awarded the Get With The Guidelines – Stroke Gold Plus Quality Achievement Award by the American Heart Association and and American Stroke Association.